In this article I will demonstrate how you can easily add a custom “Flip” to show different data on your XPage. This is a stylistic decision you have to make when creating your XPage. If you have a lot of Static data to fit on the screen and your user is ok not seeing all the same data at the same time this is a nice looking transition from one context to another. Flip.js is a simple plugin which facilitates an aesthetically pleasing transition between data contexts on your XPage. The jQuery Plugin is capable of “flipping” context in 4 directions and also reverting back to the previous context display. In my example I took the existing code which created my highcharts demo and instead of showing both the data and the chart at the same time – I am flipping between them. This is a very simple demo and yet created a dynamic effect on the page for very little overhead (12k, 5k minified). As you can see from the video above the transition is “cute” and adds something appealing to the site. The demonstration site uses jQuery, jQueryUI which are already added to my demo site through a theme and the following files. These files are added to the database via the WebContents folder as described in previous articles within this series. As you can see form the demo this is a quick and simple, effective, way to add some animation to your XPage and kick things up a bit for the user. This demonstration uses static data which in many cases works, but in others you might want to retain the XPage functionality in your flip….. The limiting factor for this demonstration is that it uses a COPY of the HTML within the panel container – what that means if that if you have a viewPanel with a pager, it will not work in this context because you are copying the HTML the XPage gets very confused if you try and then do something functional with it. What would be a major step up would be to modify the plugin code to replace the flipbox with the object itself and not a copy of the HTML container. In that way you would be able to move the viewPanel and all its functionality in and out of the flip and it would retain all the paging functionality. You’d need to create a container holding div with the panel objects within it. Suggest that each “panel” is wrapped with a div you know the id of – that way you don’t have to worry about all the dynamic HTML the XPage creates for the control. In this article I will demonstrate how you can easily create a website feature tour using the Joyride.js jQuery plugin and XPages. When releasing a new site or new features within a site it is always a good idea to let your users know what’s new and why. This can be done in a number of ways, but Joyride provides a fun and interactive way of showing the new information and can be linked to the wiki or other more formal documentation you create with a release. 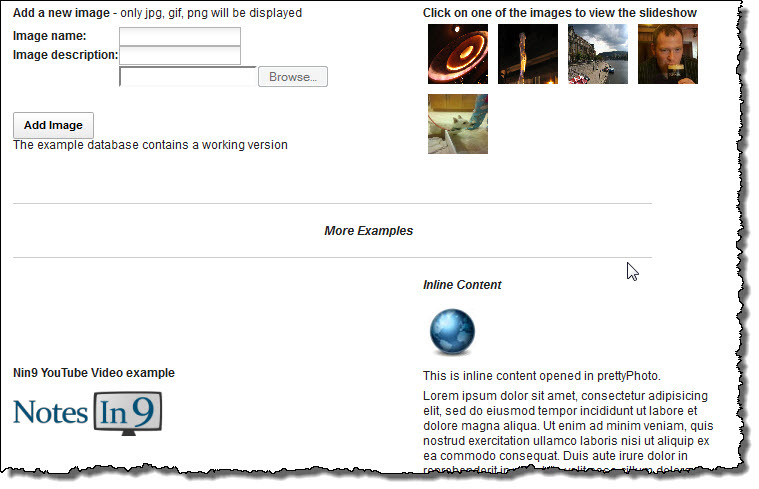 Have you ever released a new XPage or website and wanted to visually guide a user around the new features or capabilities? Well now you can with Joyridejs in your XPage. Example – Using my previous article about prettyPhoto.js as an example I can highlight to sections in a visually appealing way and guide new users around the page. We first have to add our libraries and CSS to the database. I have started to move away from using xp:resources in my source code because the XPage is trying to load the files every time we build and save the XPage which slows down development. I am using the <script> and </link> tags directly within the XPage source itself. This plugin is controlled by creating an ordered-list of the elements you wish to highlight and within that list you state the contents of the popup for that element. At the end of the code we add the activation of the Joyride – this can also be added to a button on the form if you don’t want it loading when the page loads. Joyride.js comes with a lot of options for changing the presentation of the popups – you will also notice that some of these options are stored within the data-options of the controller ordered-list. It provides another layer of flexibility for being able to control all the popups in the same way or individually depending on what effect you are looking for. You don’t want to show the tour to every user every time for the first week of the new website. There are a number of ways you could control this – how you do it is really up to you…. Provide user an opt out option and track their selection in a notesdocument or a cookie. When the user enters the application check the option and do not render the window.joyride() script to start the tour. In less than 1 hour I was able to knock up the demonstration page for this article – in the real world though you would add this tour option into the website planning from the start. The tags which the tour is displayed on are not going to affect the site if they are not used and can be added as part of the overall design from the start. These popups are also a very good way of providing helptext to a user. This is a very simple and very useful plugin which I know has lots of applicability to our applications and customers. A better beginner example would be to use a selector to get all the blank fields on a form, turn them red and notify the user. It is a good question though and I will write an article on that in the near future….. So what about Hello World in a jQuery plugin? XPages Extension Library Book – it just makes you better! In this article I will review the new XPages Extension Library book by IBM Press. If you are using or going to use XPages in your organization you need to get the Extension Library – it is already included in 8.5.3 UP1 and in the future it is just going to be part of the standard install and we won’t even consider it an “add on”. And if you are a developer using the Extension Library, like you should, then you NEED to buy this book and read it. I am not understating that fact, you need to buy it, otherwise you are doing yourself and your company a disservice. What I realized very quickly was that I thought I knew the Extension Library, when in fact I had only scratched the surface and how much more functionality I could be taking advantage of. I have used many parts of the Extension Library now for a few months and I have stolen re-used parts of the example database like the REST services and basically copied and pasted them. I never really understand what they were and how the worked, but didn’t need to either………my loss apparently. So what’s it do for me? It just makes you better – and unless you improve and get better, someone else’s going to be doing your job for you! What this book does is it breaks down all those sections you see every day in the Control Palette and explains it in simple to understand manner. Chapter 2 – Installation and deployment, written from the perspective of someone who’s had to do it, a LOT and you know they know what they are talking about. Chapter 4 – Forms Dynamic Content and More contains a section on the Dynamic Content control – that is the equivalent of computed Subforms – who knew!! Excellent !! 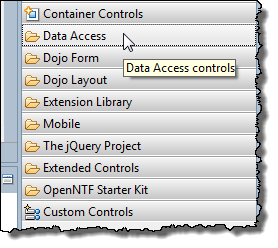 Chapter 5 – Dojo made easy– this does an excellent job of explaining how dojo is integrated into the XPage designer client with good examples!! Chapter 11 – REST services took my knowledge from 10% to 90% in an hour. Soooooo many applications for this capability, I *really* wish I had had this 10 years ago! Chapter 12 – XPages gets relational – oh yes it does baby! You know when you add an ExtLib custom control to your XPage and you see the “All Properties” and 95% of the explanation seems alien speak to you? This book provides the “real person” explanation of the property and what it does for you. Laying all the properties out together in one place also makes is a whole lot easier to understand the control, its purpose and how you use it! 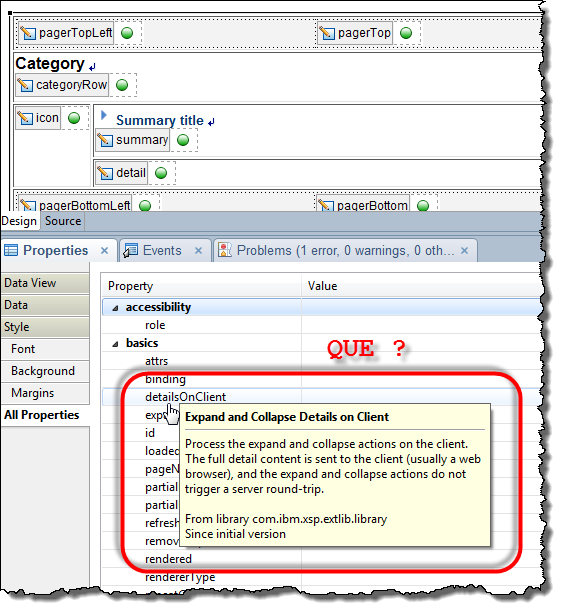 details on client – que? Is really IBM speak for…. To varying levels I have gotten to know the authors of this book over the last few months and they a genuinely some of the best people you could ever hope to meet. They wrote this book because they are just like you and me – developers – and they want to spread their knowledge and make the whole community better. This book was written by developers for developers and like I said, you owe it to yourself and your company to check it out. The cost of the book is less than an hour’s worth of your time to your company and unless you are an XPage ÜberGenius already, you cannot help but learn from this book and it will pay for itself the first day you really sit down and read it. Go Buy it ! No buts, just go buy it.